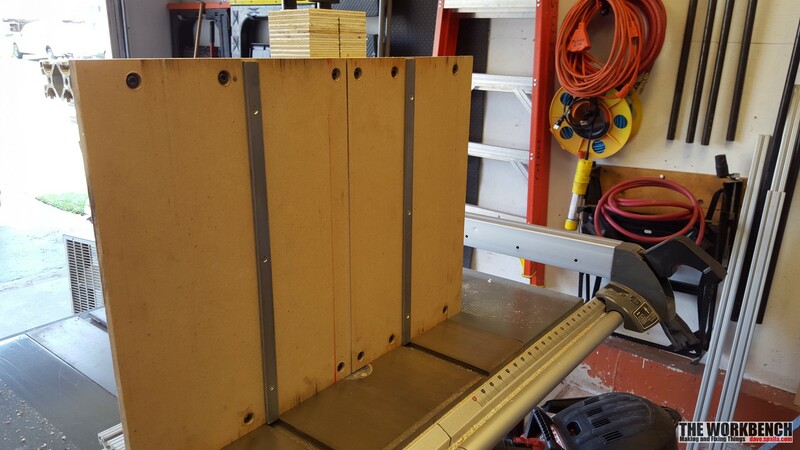 A cross-cut sled should be one of the first jigs that a woodworker makes for the tablesaw. 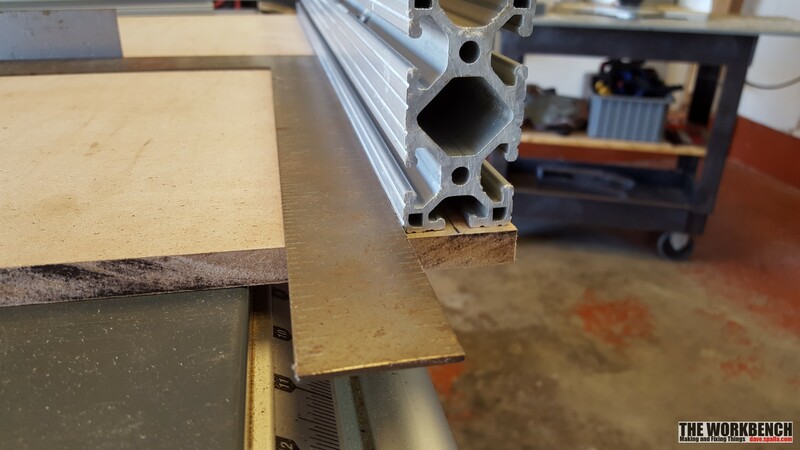 It’s more accurate that the typical miter gage and is safer to use. 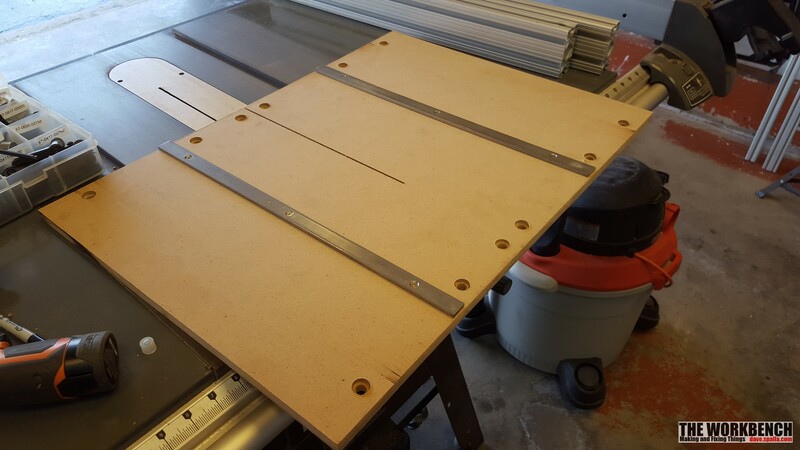 I’ve made a few versions over the years, but have not created one for the the Porter Cable table saw purchased three years ago. There are a couple things that set this version apart from the many variations seen on youtube and various websites (or even Norm’s). 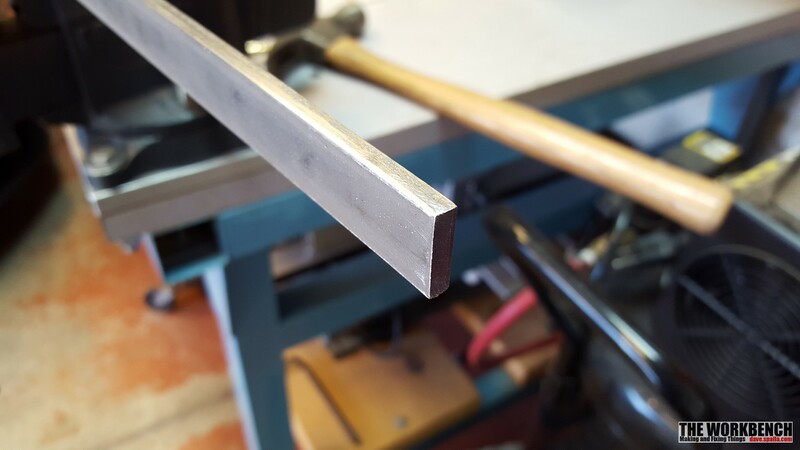 First, the runners for the miter slots are made of steel, not the usual hardwood. Second the front and rear structural pieces are aluminum and not wood. 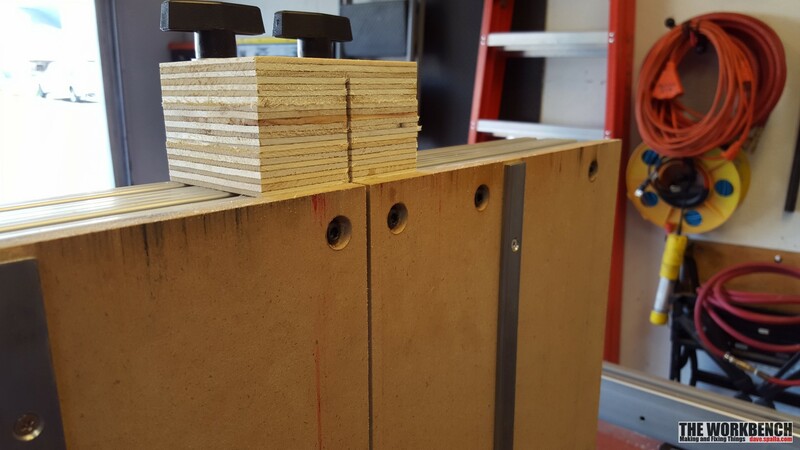 With regards to the runners, wood seems to move too much with depending on humidity causing it to either be a perfect fit or too tight. The steal was purchased in a four foot length and cut in half. 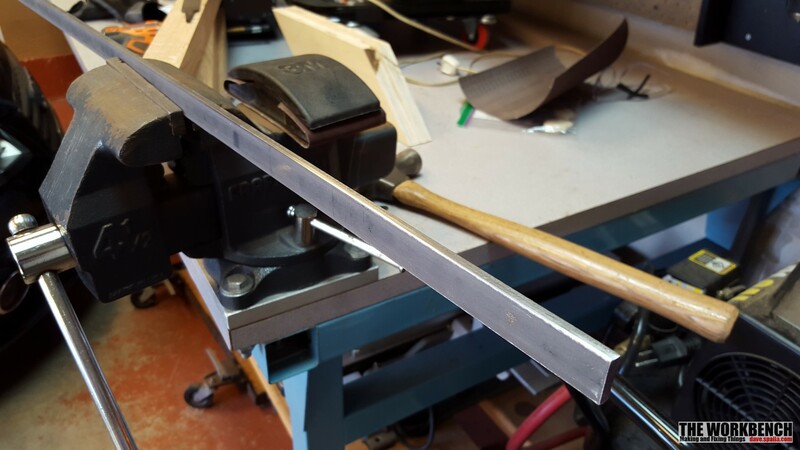 Since it was slightly larger than the miter slot, it had to be filed down to fit. 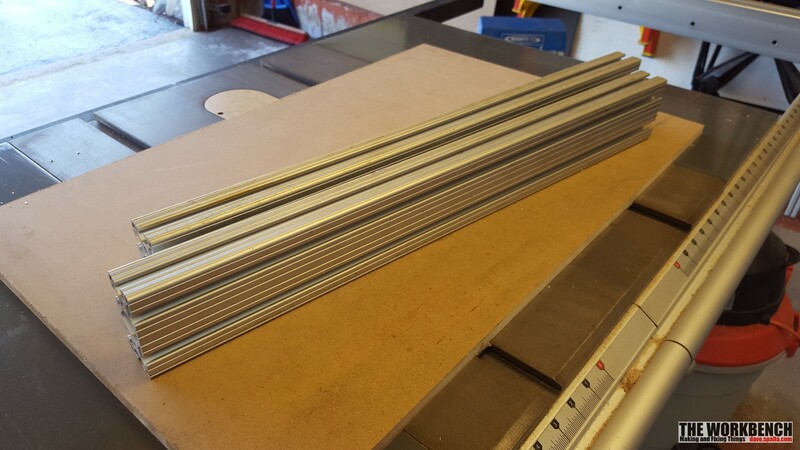 Not too much, and just a few passes on each edge making sure to test fit during the process. When it was close, 400 grit sandpaper polished the edges smooth. 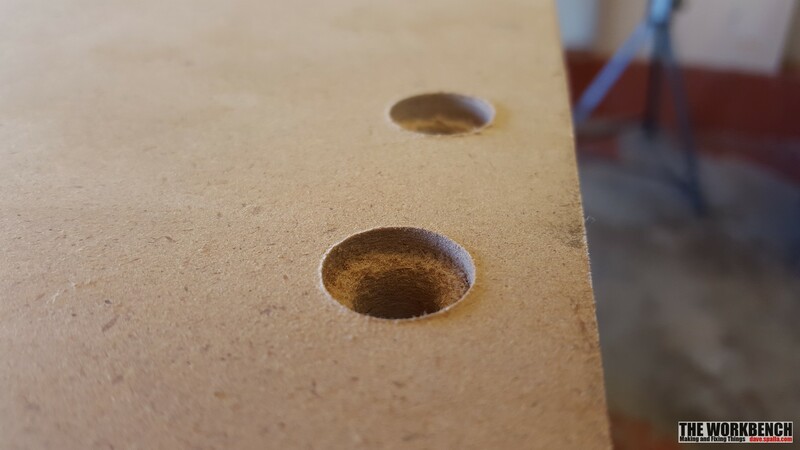 Next, holes were drilled and countersunk on each runner. The hole size and countersink depend on the screws used which is dependent on the sled material thickness. Clean the steel to remove any oil or other contaminants and put the double-sided tape on it. Leave the paper attached for now. 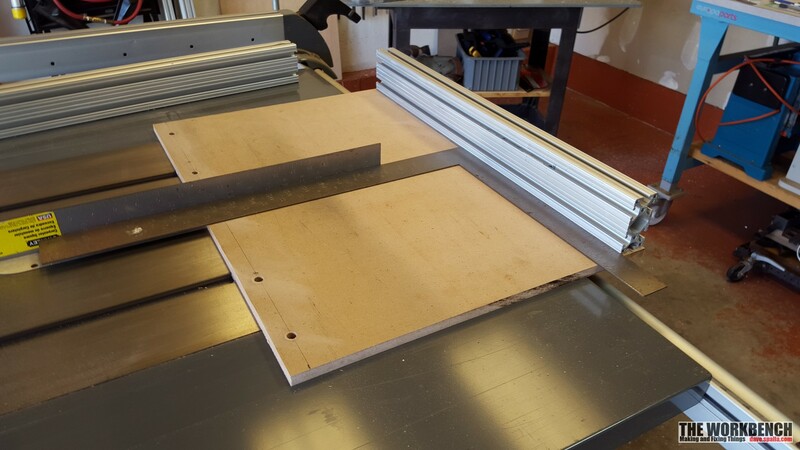 The metal is much thinner than the slot, so a few spacers are required to hold it flush with the table top. Six, 5/6″ nuts worked in this example. Place the nuts in the slot, put the steal strips on top of the nuts and remove the tape paper. 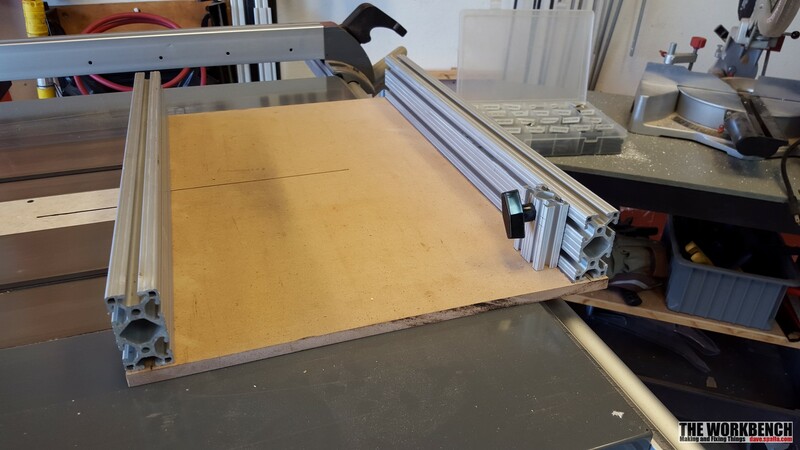 Carefully center the MDF over the runners and align with the front of the table. Press down firmly to attache the runners to the MDF. Flip it over and install screws to secure. 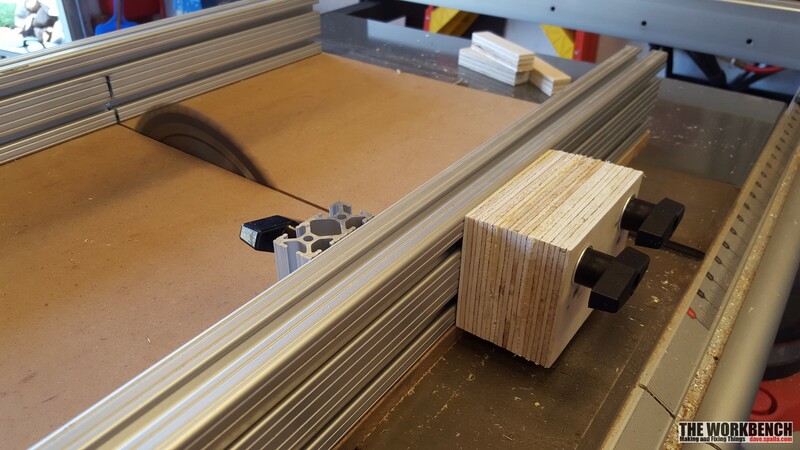 It’s not critical that the runners are square to the MDF, but it should be close. What is important is that the runners are parallel to one another. Slide the sled to test out the fit, it should move without binding along then entire length of the table. 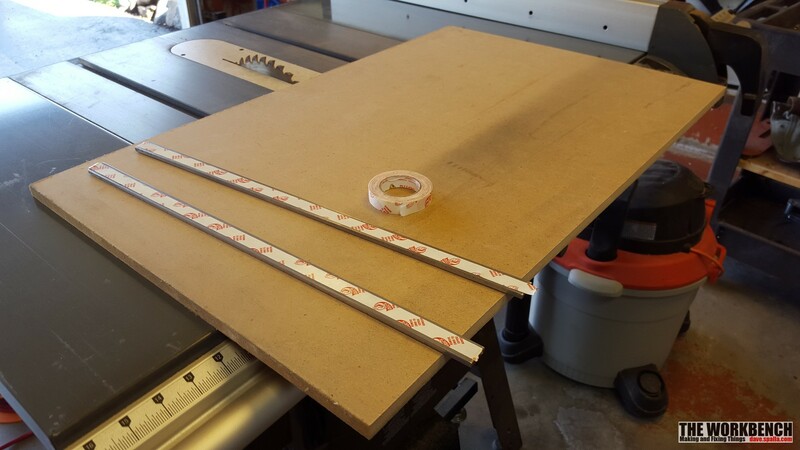 If not, use the file to adjust being careful not to cut into the MDF. Next, saw a slot about halfway through the sled. The next part is to attach the two structural pieces. These are what actually holds the sled together, and must accurately installed. The mounting hardware requires a countersink. 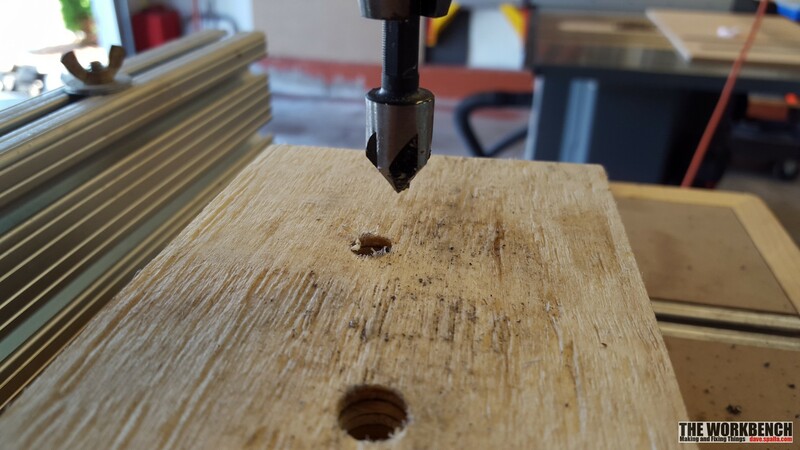 A total of 12 holes need to be drilled and have corresponding countersinks, the countersink was made with a Forster bit. 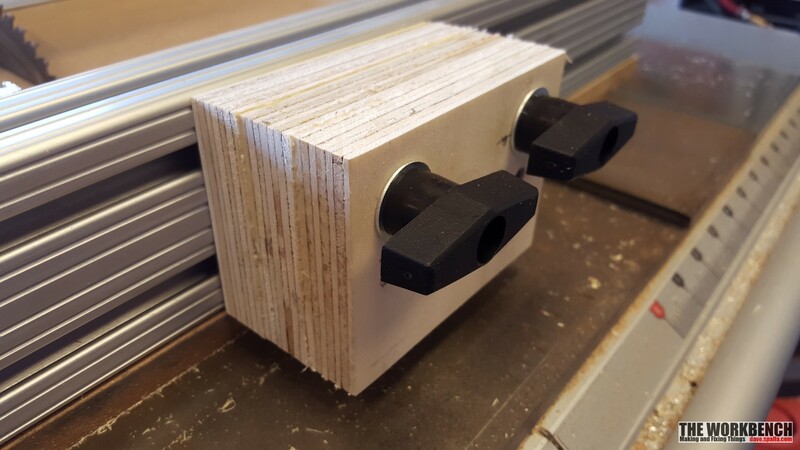 Using a couple framing squares, align the rear rail to be exactly square to the saw blade. Tighten the hardware to secure it in place. Now install the front piece (alignment is not critical), add stop and safety blocks. 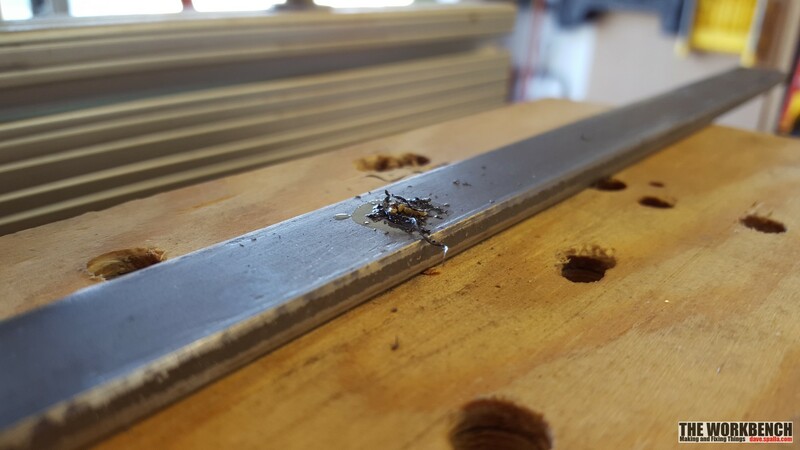 Using a spare carbide-toothed saw blade cut through the aluminum at the desired height. That’s the project completed. 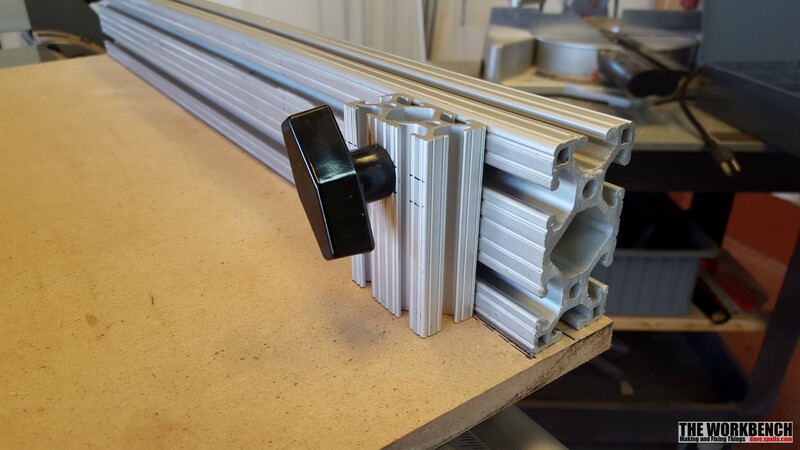 One of the nice things about using the extruded aluminum is the attachments that can easily be added. It addition to the stop-block, toggle clamps are also a useful add-on.